Abstract – The design and optimization of protective equipment and devices such as exoskeletons and prosthetics have the potential to be enhanced by the ability of accurately measure the positions of the bones during movement. Existing technologies allow a quite precise measurement of motion — mainly by using coordinate video-cameras and skin-mounted markers — but fail in directly measuring the bone position. Alternative approaches, as fluoroscopy, are too invasive and not usable during extended lapses of time, either for cost or radiation exposure. An approach to solve the problem is to combine the skin-glued markers with ultrasound technology in order to obtain the bone position by measuring at the same time the marker coordinates in 3D space and the depth of the echo from the bone. Given the complex structure of the bones and the tissues, the echoes from the ultrasound transducer show a quite complex structure. To reach a good accuracy in determining the depth of the bones, it is of paramount importance the ability to measure the time-of-flight (TOF) of the pulse with a high level of confidence. In this paper, the performance of several methods for determining the TOF of the ultrasound pulse has been evaluated when they are applied to the problem of measuring the bone depth. Experiments have been made using both simple setups used for calibration purposes and in real human tissues to test the performance of the algorithms. 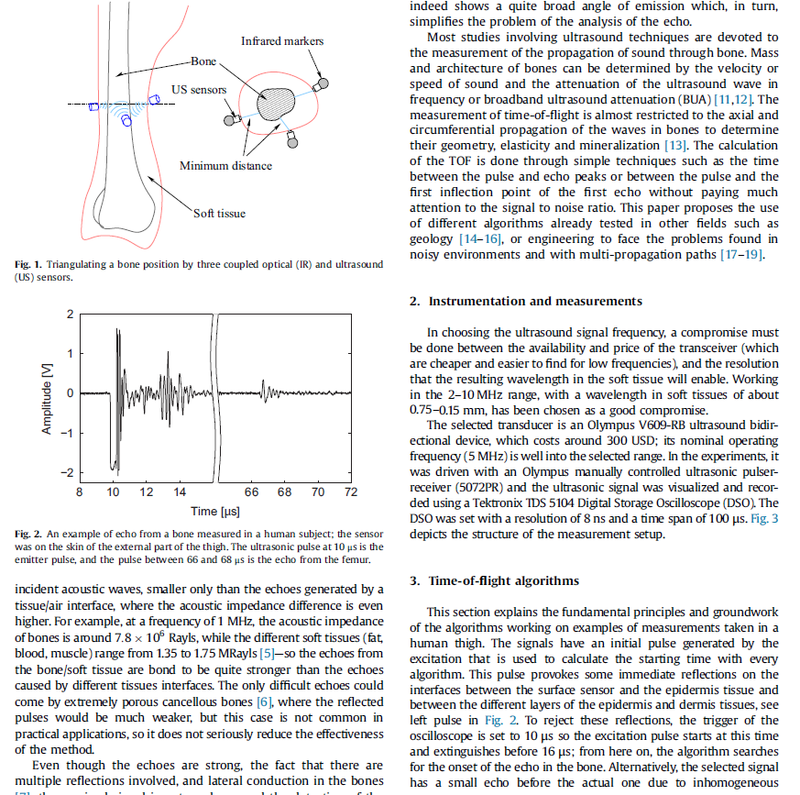 The results show that the method used to process the data to evaluate the time-of-flight of the echo signal can significantly affect the value of the depth measurement, especially in the cases when the verticality of the sensor with respect to the surface causing the main echo cannot be guaranteed. Finally, after testing several methods and processing algorithms for both accuracy and repeatability, the cumulative kurtosis algorithm was found to be themost appropriate in the case of measuring bone depths in-vivo with ultrasound sensors at frequencies around 5 MHz. Keywords – ultrasound, time of flight, biomedical transducers, ultrasonic transducers, localization. R. Albarracín, G. Robles, J.M. Martínez-Tarifa J.A. Ardila-Rey Separation of sources in radiofrequency measurements of partial discharges using time-power ratios maps. ISA Transactions, vol 58, pp. 389-397, 2015 (ISSN 0019-0578). Abstract – Partial discharges measurement is one of the most useful tools for condition monitoring of high-voltage (HV) equipment. These phenomena can be measured on-line with antennas provided that the signal to noise ratio is improved by reducing common radiofrequency (RF) emission. One approach to this problem is the use of specific sensors like Vivaldi antennas which reject FM radio and low-frequency TV broadcasting bands. Additionally, the application of advanced signal processing techniques is paramount to separate noise and interferences from the signals of interest. 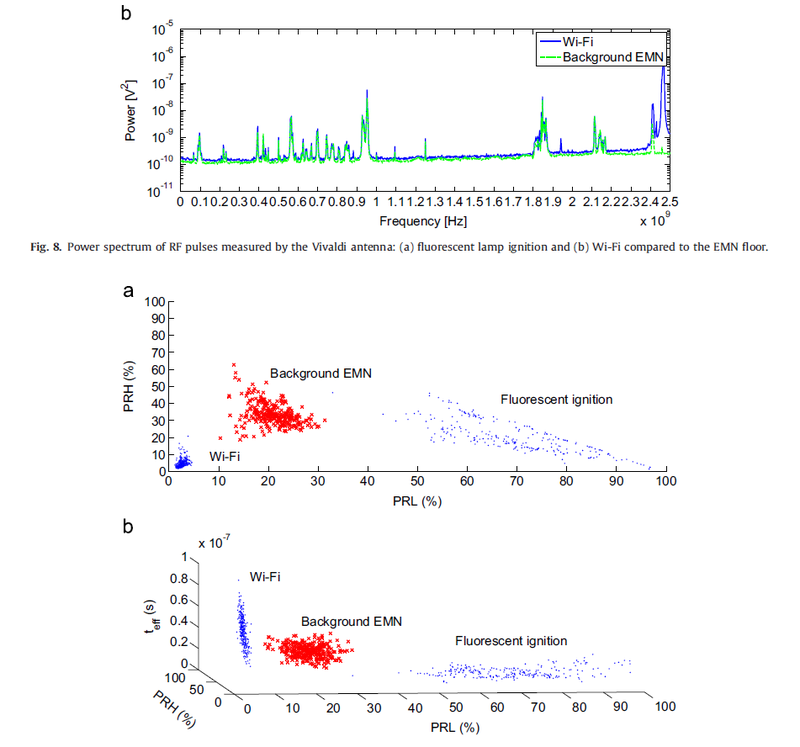 In this paper, the power ratios (PR), a technique based on the power distribution of the incoming signals in frequency bands, is used to characterize different sources of PD and electromagnetic noise (EMN). The calculation of the time length of the pulses is introduced to separate signals where the PR alone do not give a conclusive solution. Thus, if several EM sources could be isolated and previously calibrated, it is possible to detect pulses that correspond to otherevents, quite possibly from PD activity. Keywords – Partial discharges, dielectric materials, condition monitoring, RF measurements, VHF and UHF measurements, Vivaldi antennas, spectral power.